Fully customise your chosen eForms system with a variety of Add-On Modules and optional features. In various scenarios, eForms need to be accompanied by evidence documentation. The Attachments / Evidence Collection module allows images taken using a camera or scanner to be attached to eForms. Images can be stored alongside eForms once submitted, and also exported to the document system as a single case. 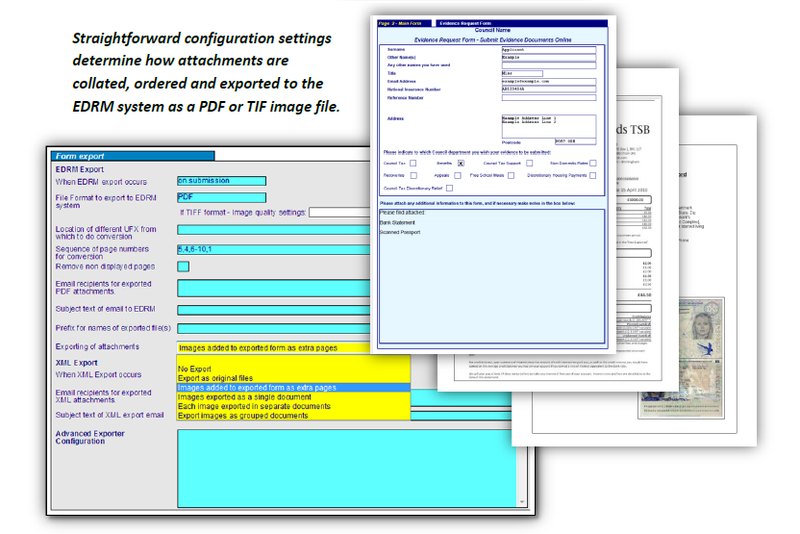 To assist indexing in the Electronic Document Management System (EDRM), images may be named and grouped into meaningful groups for exporting as separate PDF or TIFF files. Attachment of electronic files to an eForm is available as an option for any eForm supplied. This option enables the attachment of pre-determined electronic file formats and the ability to set limits to their size (a white list), limiting any risk to IT systems at the Council. When used on the offline module, the system provides for automatic camera connection. Multiple pages of documents may be photographed, and when the camera is then plugged into the laptop, the software automatically retrieves images from the camera and attaches them to the in-progress eForm. Using Victoria Forms’ powerful add-on module, statistics are easily generated from form data within Enterprise Forms Server. Records can be filtered by eForm type, eForm category, individual user, user group (including web self-service) and date of submission. The built-in Report Designer allows you to define the eForm fields that you want to report on. Simply open any eForm template and click the question fields you want to assemble statistics about. Reports are generated on the server within a few seconds. If you wish, you can save the report template for re-use later, or make amendments to it and then re-run the report. After creating a report, the exported data appears within the statistics module and can be opened in any popular spreadsheet application, including Microsoft Office Excel. Within the Excel spreadsheet, data may be analysed however you wish. The statistics module can be extremely useful for benchmarking and setting key targets within your organisation. eSigning allows customers to sign completed forms in their own home using a device compatible stylus or attached eSigning pad. 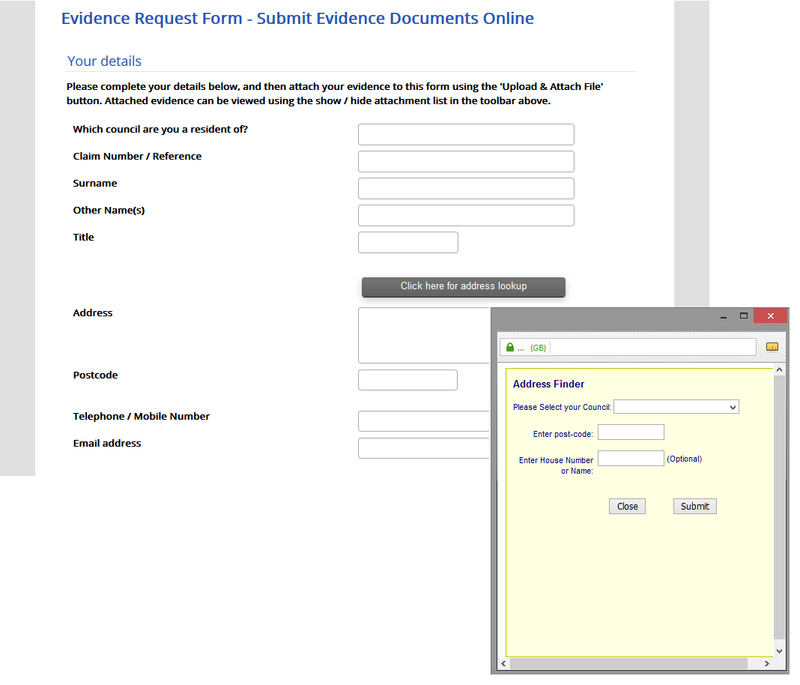 The attachments / evidence collection module is ideal for offline working – fill in forms in the customer’s home or business premises, then photograph documents and attach them to the eForm before submission. The form and evidence is then handled as one case. Our offline eForms bridge the gap between paper forms and online solutions. Situations arise where a constant internet connection is not possible, and organisations could be forced to resort to using paper forms and have to manually enter information when connectivity is restored. Where regular offline form completion is required, our offline forms module provides the user with fully functional eForms offline, which can then be seamlessly submitted to the server when connected to a network. Our internet forms for all devices can run offline once downloaded; however, they must first be opened from an online forms system. 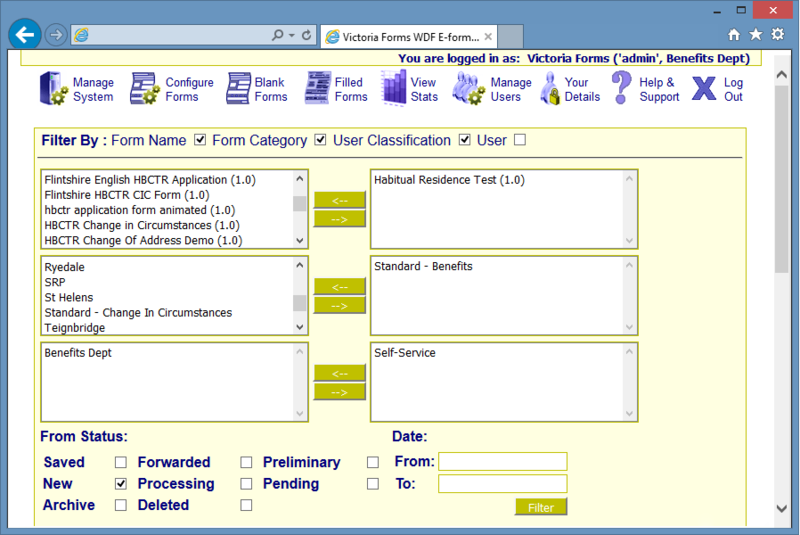 Victoria Form’s offline eForms capability is enabled by the local installation of an application module on a Windows laptop, Notebook or Tablet. This enables the remote use of all authorised offline eForms sanctioned for the given user, without any internet or network connection. 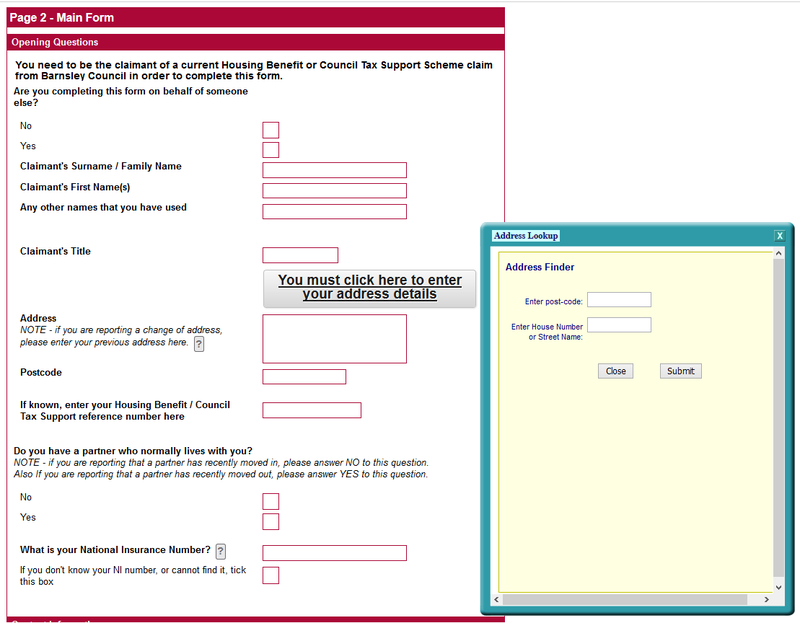 These eForms may be opened, filled, E-Signed, and saved, all while offline. 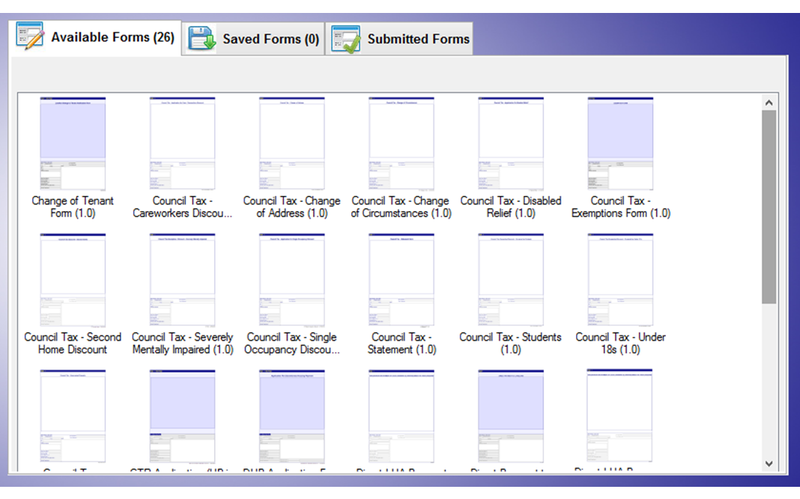 Synchronisation of completed eForms occurs automatically when the user is next connected via the internet or Council Office network, to the Enterprise Forms Server. Offline forms have all of the advanced features available with the standard browser versions. Any form asking for an address can have the Address Lookup functionality added to it. Using a snapshot of a back office property database, or a service such as Gazetteer, the form links to the existing address database to return results based on what is entered into the search field. If Address Lookup is enabled on the form, the address field will be inactive until the address lookup window is launched, avoiding mistakes in typed addresses. Customers are presented with a button which opens the address lookup window, where they can search by street name, postcode or partial address. A list of results from the connected database is returned and the customer can select a valid address from the list. If the customer’s address is not there, depending on how the form is configured, there is the option to type in an address manually. The lookup facility proves itself most useful when forms are integrated directly into a back office system, where the addresses listed have an associated Unique Property Reference Number (UPRN) ensuring that the back office system accepts the address as valid. Addresses without the UPRN may require manual intervention for processing, which is time consuming. Address Lookup can be enabled or disabled on a form by form basis, as can the additional option to allow customers to manually type in an address or not – giving you full control over how the lookup works for your forms. 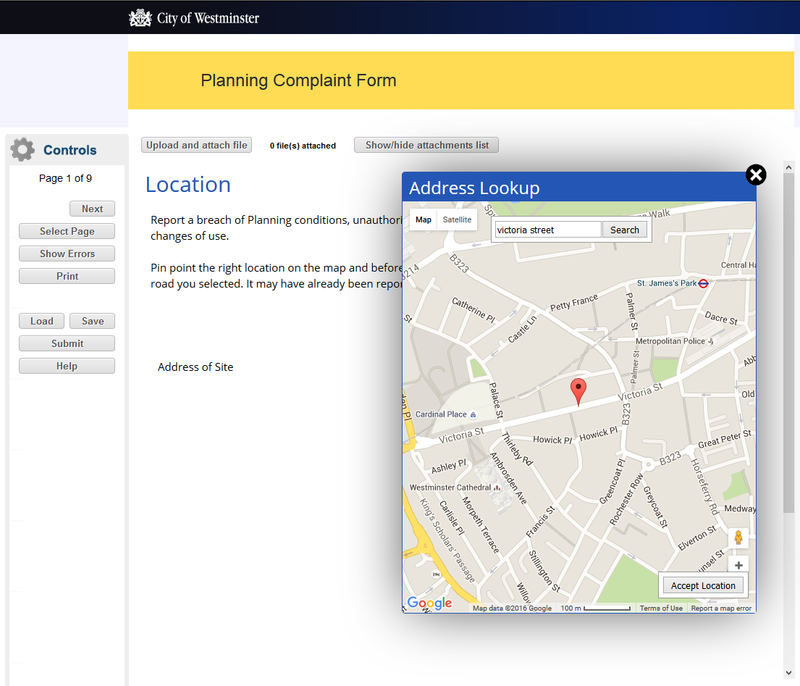 For forms where location is important, customers may benefit from having access to an interactive map to select the correct address, over and above an address lookup. This is especially useful in situations where the customer does not know the postcode of a property. The Victoria Forms service uses Google maps to provide an integrated map within the form, so customers can drop a pin on their selected location (or use location services to automatically do this) and the system will return relevant information about nearby locations. The communication with the database held within a back office system (such as Idox Uniform) provides very accurate location results, as it uses registered addresses instead of using simple geocoding. 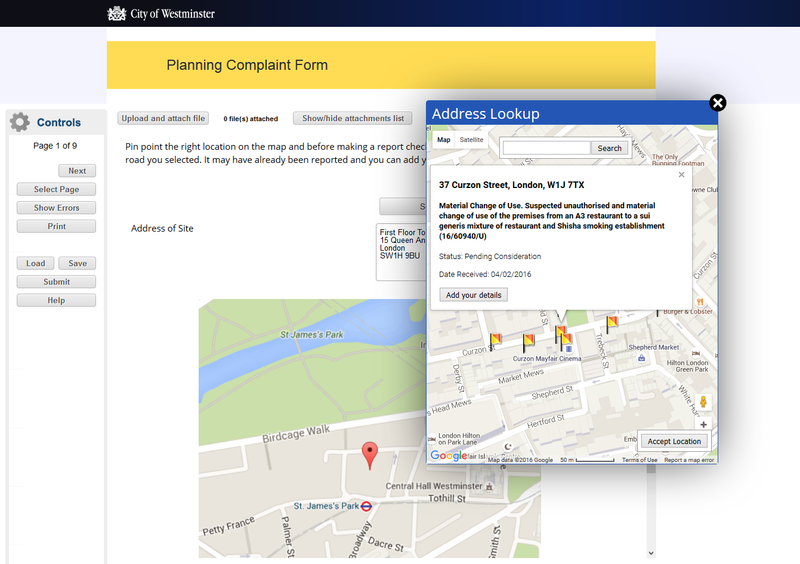 Currently the maps functionality is in use for Planning Complaints (City of Westminster), where the maps service communicates with an Enforcement Connector provided by Idox Uniform to send information from the database about existing complaints, back to the map. 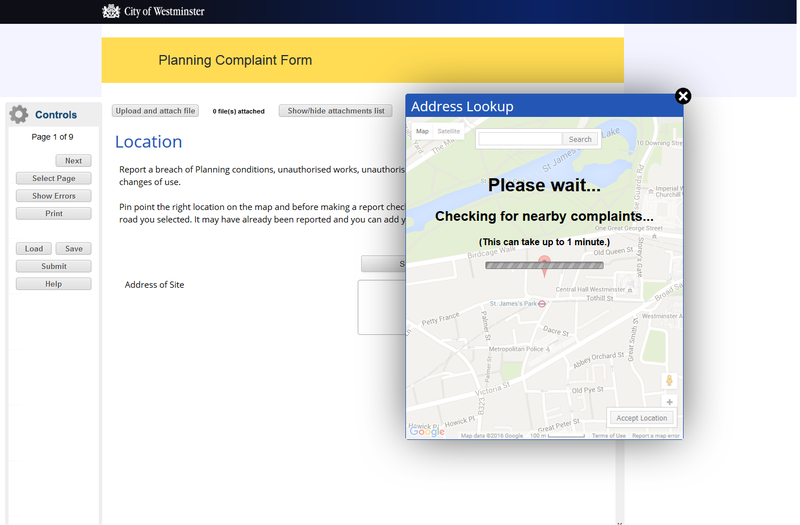 This allows customers to see the existing complaints within a radius of their selected location and either add data (such as photographs) to the existing complaints, or choose to file a new complaint using their original dropped pin. Using the same approach, there is potential to communicate with other connectors supplied by Idox Uniform to send information back to the map – as long as the information contains a location, it can be used. Where fees are applicable, forms can connect with your authority’s chosen payment provider to incorporate a seamless transition between form data and payments. Selected information can prepopulate the payment system, such as customer name, and validated email address, which saves time for the customer and prevents errors for processing. Upon clicking the ‘Submit’ button, the applicant is taken to a payment page in a new window where they can input card details securely and pay the required fee. Once the payment has been accepted, the system closes the payment window and sends the applicant back to the submitted form, as well as displaying a confirmation message, which can contain information such as a receipt number from the payment system. The submitted form data contains relevant information from the payment system, which can be sent to Idox Uniform if integration is set up. This allows the application and the payment to be linked with the receipt number and a Uniform reference, which can automatically be sent out to the applicant in an email. Payment systems we currently work with include: XPay, CivicaPay and WorldPay. Victoria Forms developers can look into creating similar integrated functionality with other payment systems as required. Similarly, additional customisations to the advanced payment processing functionality can be developed according to customer specifications. Where a signature remains a legal requirement, eForms can be transmitted electronically, but the declaration pages would normally have to be printed, signed and returned by post. This slows down form administration and makes it more difficult for the user to complete forms quickly. Victoria Forms supplies the eSigning add-on, where forms requiring a signature can be signed electronically, resulting in a completely paper free process. Electronic signature fields are positioned within the eForm and document pages in the same way as an ordinary field. For appropriate users, and for forms for which electronic signing is configured, an electronic signature button appears on the form viewer interface. After the form is completed, clicking the electronic signature button initiates a validation check of the form. When the form is free of errors it is date stamped and signature fields on the form are then enabled, which initiates Victoria Forms’ E-signing software. Users can then make their normal signature with a stylus on a signature pad (available from various vendors). Alternatively, users with touch-screen devices can sign on screen. The signature is then encoded and is displayed on the signature fields within the form. Once electronically signed, forms may then be submitted to the server. After being opened from the server, forms may then be printed with the signature appearing on the printed page. 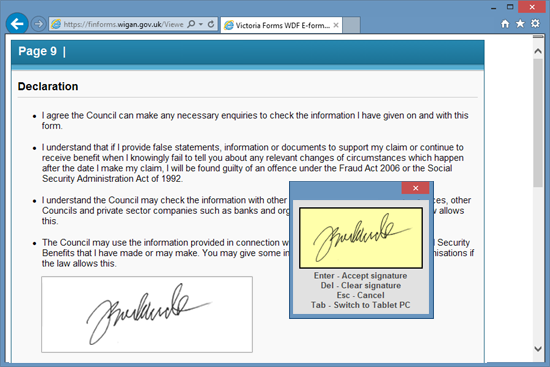 With Victoria Forms’ document system exporting module the signature will appear in the form image sent to the document system. It is not hardware specific. It works with electronic signature devices and conventional graphics tablets supplied from a range of vendors as well as smart phones and tablets. This means that users do not have to invest in expensive hardware to achieve paper free processing. It does not require users to pre-install any proprietary software. The software works within an unmodified web browser. 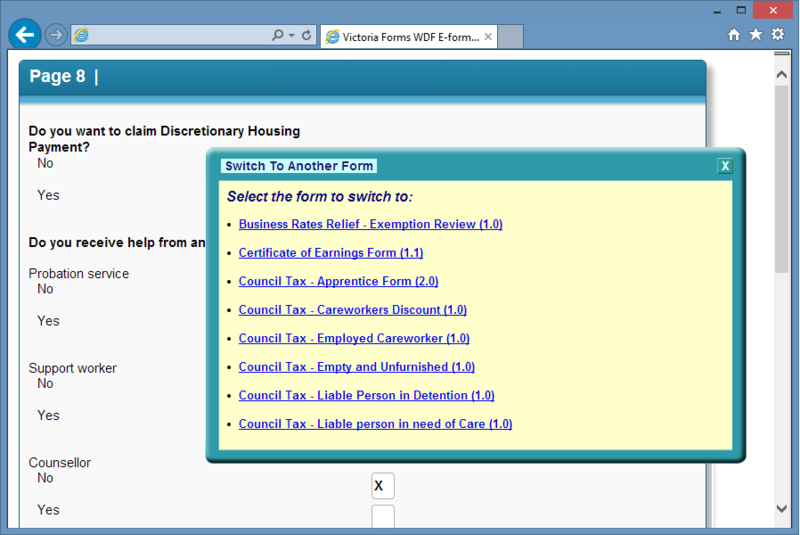 For councils that wish to use our eForms in conjunction with their own CRM system and / or a Customer Portal, Victoria Forms supplies a ready-made module, which allows integration with minimal additional coding. Automatic authentication: members of staff who are logged into the CRM or Customer Portal can go directly into our system without having to log in. Our system then knows who they are and gives appropriate access and tracks their use of eForms accordingly. eForm pre-population: Useful data can be passed from the CRM or Customer Portal system to pre-populate eForms in open XML format. Controlling eForm features: the XML data sent from the CRM and Portal systems to the form can include instructions to control the eForm, e.g. turning off forced error checking, turning on letter template pages etc. Access to Part-filled Forms: Customer Portal users can be presented with a list of eForms that have been saved in the eForms system for quick retrieval. 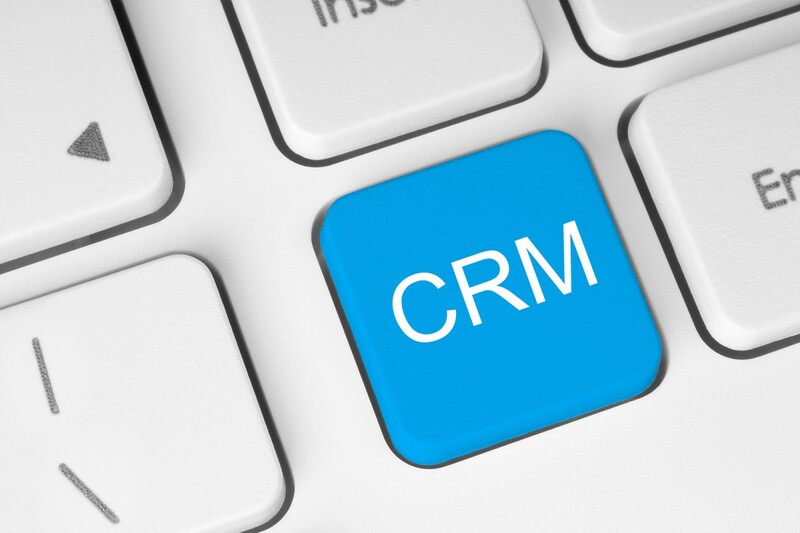 Data return: where useful, data can be returned to the CRM and Customer Portal systems in a suitable format. This can be data from the eForm, but also data about the eForm – this information can then be added to the CRM system alongside the appropriate customer’s record (e.g. 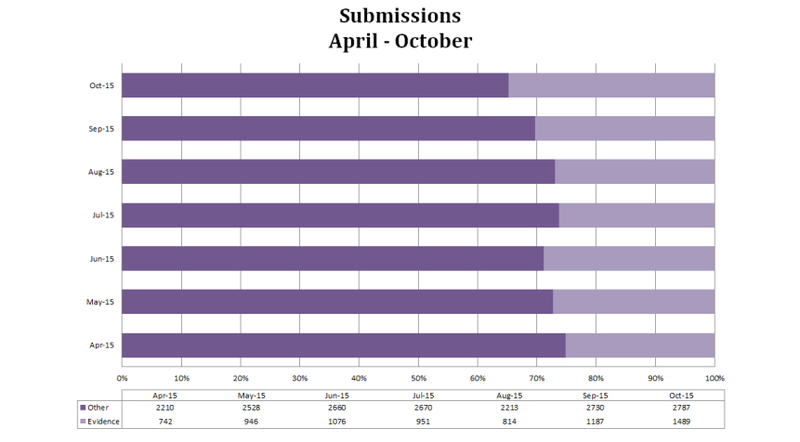 submission date). You start with a library of blank eForms. Each form can be filled in and submitted separately. Our multiform technology allows a group of eForms to be filled in as one case. It is most useful when capturing information for multiple departments or for multiple organisations. The technology is designed to make this task easy and productive. We are building a growing library of standardised eForms for use with the Multiform component including Education Benefits, Pension Credits, Attendance Allowance, DLA / PIP, Care Assessments, Crisis Loan Applications, NHS Prescription benefits, and electoral registration eForms. A customer applies for a mortgage. As well as the loan application, they also have to fill in an additional form for a bridging loan, an employment income certification form, an income insurance form, and a bank account application form. A family has just moved into a new area – they contact the council wishing to apply for housing and council benefit, and for free school meals. They also want to be placed on the electoral roll, request a replacement wheelie bin, and they want to get a library card. A welfare worker visits a newly bereaved pensioner. They want to fill out a housing benefit claim form, a pension credit application, a bereavement allowance for a funeral, a property damage report form, and a care assessment form. In the above scenarios, using paper forms, users are faced with time-consuming and repetitive form filling. They have fill in a package of different forms, entering the same information again and again. This negatively affects productivity for advisors and can be frustrating for customers. a list of optional forms that might be of use. Intelligent form selection ensures that users fill in the exact forms that are relevant to their case. Different questionnaires can be provided to intelligently build form packages under any number of different scenarios (e.g. a local authority might handle a family bereavement, moving into a new home, providing help to someone who has become homeless). 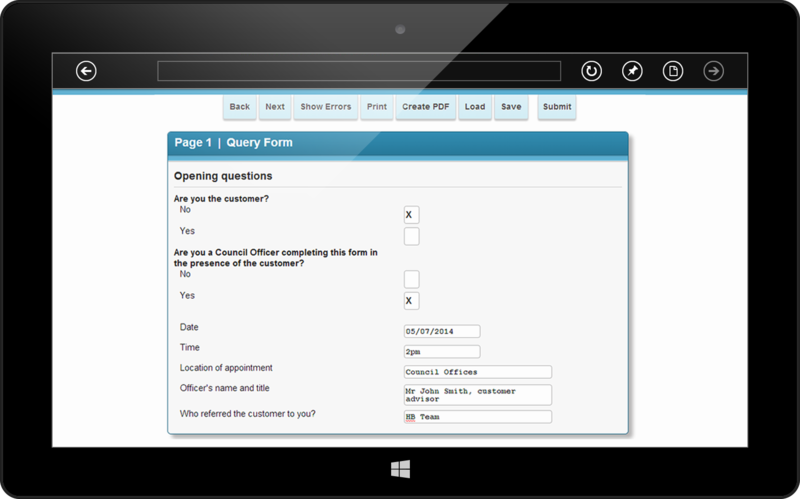 The questionnaires we provide are designed within our eForms design software package and can be customised if you require. The user fills in one form at a time, but information entered on one form is automatically passed to any other form in the package that asks the same question. Information is only entered once, regardless of how many forms on which it appears – this greatly reduces the amount of time form filling takes. Users can go back and forth between forms in the package, filling them in any order, and if a change is made on one form which could have implications for other forms, this will be indicated to the user. Further intelligent form selection can be generated from within the form package itself. Data entered on one form can initiate additional forms to be added to the package. For example, if a user says that they are self-employed on a benefit claim form, the system can add a self-employed earnings declaration form to the multiform package (which will already be pre-populated with the customer’s details). As the user fills in forms, the multiform package constantly validates itself, drawing the user to any forms with outstanding errors or unfilled portions. This ensures that all forms are filled in completely and free of errors. On completion of a multiform package, the underlying software can take form data and use it to populate a set of documents. These might include declaration pages for signing, customer specific guidance, letters for one or more recipients, and/or blank forms for printing and handing to other parties. 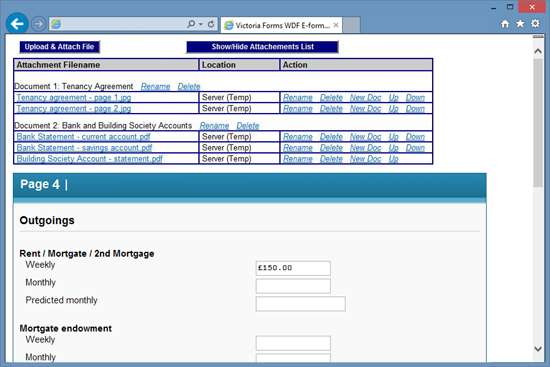 On completion forms are submitted to Enterprise Forms Server. The multiform package is then separated into individual forms. Each form will then follow its predefined rules for processing – each can be routed to a separate department or different back-office system. Each form will be treated as if it had been filled-in separately by the user. In order to handle the sharing of data over numerous forms, Victoria Forms has designed a data dictionary that contains 6,000 separate data elements. Direct Debit Integration into Northgate allows our forms to automatically update the Northgate system with any new direct debit instructions submitted by the Council Tax account holder. The service validates the Council Tax Reference provided, and can then change instalment plans for an account, as well as being able to apply temporary account suspensions if required. Automatically check bank account details in real time as they are entered into the form with the Bank Account Detail Validation Add-On. The form opens a new window when the user clicks into the Sort Code or Account Number fields, and prompts for entry of valid details. 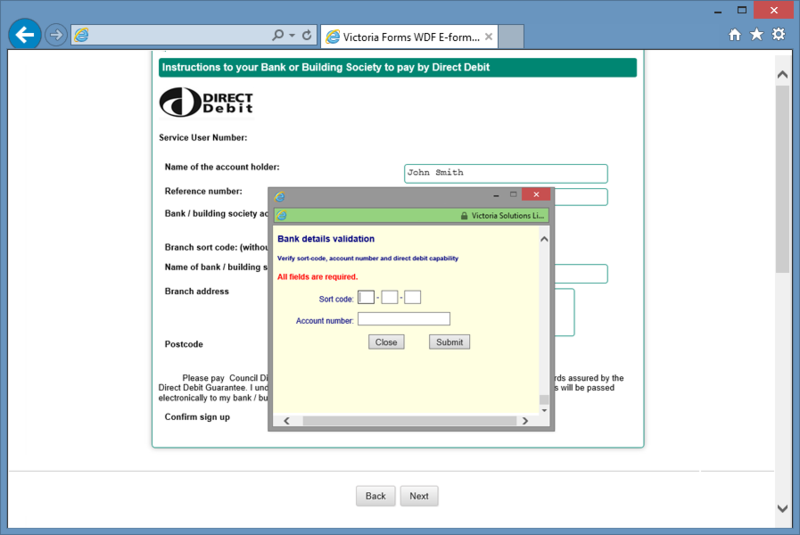 An instant validation result is returned from a third party web service showing the status of the validation checks and whether the account can be used for Direct Debit payments for example.